So yes, we’re probably repeating ourselves, but it’s really been a breathless few years. The way that people have believed in and helped supported us has been incredible and propelled us to places that we never could have imagined being. Now we want to make sure we make the most of that without losing the messy, resourceful, collaborative spirit that got us all here in the first place. We’ve met some impressively inspiring people, listened to a deal of good advice and enjoyed experimenting with some new projects, such as the Microfestivals and the Forest Fringe Travelling Sounds Library. We’ve discovered things that work and things that don’t. 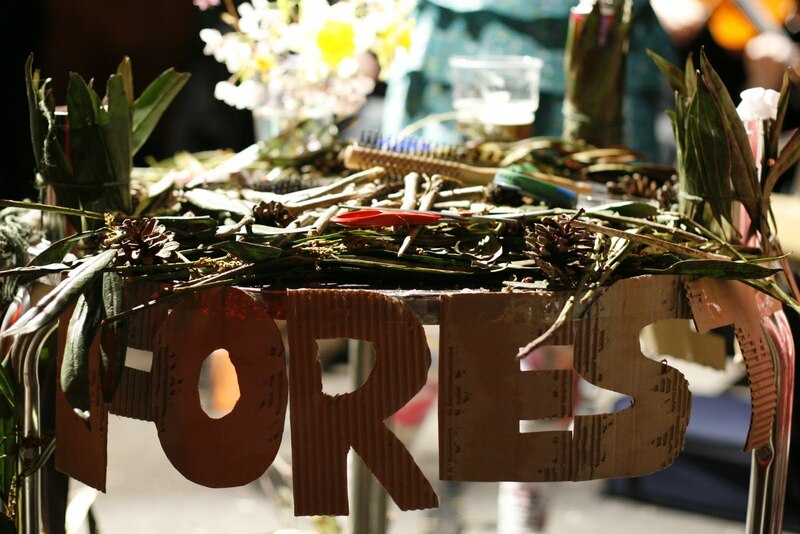 We've learnt that maybe the best way of summing up what Forest Fringe does well is to say that we bring people together in ways that make the sum greater than its parts. Opportunities for co-operation and collectivity that mean that out of very little we can create the spectacular and the implausible, benefiting everyone involved. Maybe its flash-mob curating, providing exciting invitations and leaving it up to artists to decide if and when they want to be involved. Maybe it’s just about being a moveable home that people can keep coming back to. As we’ve been doing all this talking and thinking and sharing we’ve been thinking about our home in Edinburgh and realising it’s a shame there isn’t more space for these conversations and collaborations to happen there. Edinburgh is an arts festival that has a bigger and more dizzying array of people involved than any other. Yet every possible cupboard and dungeon and bar is transformed into a venue, meaning anything other than putting on shows is crowded out. And that can be an exhausting experience, especially when all the bars and cafes are overcrowded and overpriced and your flat is a crampt bolthole 40 minutes walk away. The thing we’ve always liked about Edinburgh is that whatever you may think its failings may be, the best possible response is to offer your own alternative. If you build it they will come, as sad-eyed baseball-loving movie star Kevin Costner once said. So we've decided to try and create our own space for reflecting and catching our breath. We wanted to see how we might build something more than just a venue for putting on shows. After all, people have often said that Forest Fringe felt more like a refuge or a home – we felt we wanted to live up to that. Far from expanding ever outwards in some ever-accelerating tidal wave of growth, this year we’d try and take the chance to reflect on what we do and how we do it. To experiment with what else we might do. To find space in Edinburgh for things that should happen but at present don’t really seem to, all the while continuing to support artists and put on weird and brilliant shows and experiments in the way we’ve always done. A festival of thoughts, from 12pm-5pm, offering a whole range of new and exciting ways for people to gather at Forest Fringe and talk and collaborate and generally be inspired. A festival of ideas, from 5pm till 11pm, showcasing a lovely collection of work by some great artists in the way we’ve always done in the past. A festival of experiences, from 11pm till late, where we’ll transform our space into a series of massive late night parties full of music and art and good times. And a festival of adventures, all over the shop, inviting you to head out into the city and explore a range of hidden off-site projects. So that’s what we’re up to. In the following few days we’re going to post some more details on exactly what you’ll be able to experience and be a part of in each of these joyous fandangos. But for now we hope you appreciate us trying to explain what it is we’re up to and we definitely appreciate you taking the time to read down to the last but one sentence – good job. These are frightening times and exciting times – let’s see what we can make of them.